Phil Groundhog used to think that having a shadow was cool. Shadow jumped with him, laughed with him, sang with him. But now that Phil grew up, he and Shadow don't seem to have too much in common anymore. Phil likes to eat dandelions, Shadow tacos. Phil like to spend his vacations in a local beach, Shadow wants to see the world. The worst is that sometimes Shadow embarrasses Phil in front of his friends. Why can't Shadow be like any other shadow? Phil has had enough. He is so angry he wished Shadow would go away. And Shadow went away. Phil feels so alone... Searching for Shadow around the world sounds scary, but Phil has to find him. This book is so silly and funny! 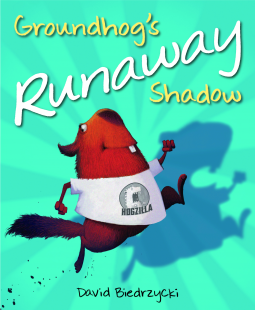 A serious and responsible groundhog trying to hold at bay his irreverent shadow makes a totally enjoyable read. It makes you want to play with your shadow again. The characters are lovable. The story is told with short sentences and few words, the illustrations playing an important role. A great read if you are looking to just have some fun.